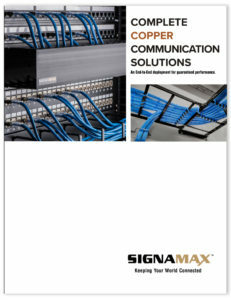 The Signamax Certification Program is designed for companies and individuals working in the cable installation, infrastructure, and design environments. Those in the business know there is more to building a cabling system than just buying good quality cable and connecting hardware. To guarantee proper performance, a structured cabling system needs to be properly designed, installed, and administered. The Signamax Certification Program enlists a mixture of lecture, design exercises, and hands-on experience to train and certify professionals in the proper procedures. When your company has a team of certified professionals backed by the Signamax 25 Year System Warranty, it will provide your customers, and prospects, the reassurance of a firm that can install systems meeting and exceeding industry standards. Register to be a Signamax Certified Installer, Designer, or Consultant today and increase your competitive advantage! *Have you previously held a Signamax certification?